-- a quantitative analysis of the mesh generation method and results will be summarized in a full paper that is in preparation. At the beginning, this brain atlas FEM mesh was created for nothing but testing the Mesh-based Monte Carlo (MMC) code performance with a complex geometry, as well as making pretty figures for my paper. Because of the limited image resolution and the constraints of the meshing tools at the time, the mesh was not anatomically accurate. 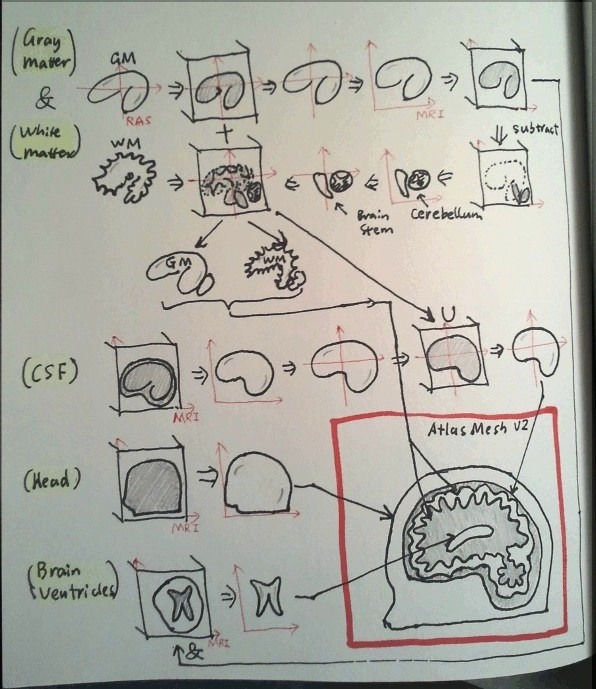 Interestingly, soon after the first release of the mesh, I was approached by friends and colleagues, who showed their interests in using this mesh for their brain functional studies. In the meantime, the unsatisfactory about the inaccuracy of the mesh began to surface from these interactions, for example, the CSF layer is thicker than expected, the gyri and sulci on the pial (gray-matter) surface are not clear, and so on. Surprisingly, an anatomically accurate brain atlas mesh is absent for the community, probably part of the reason is due to lack of meshing tools that are capable of handling complex volumetric images. After extensive search and reading, I was finally convinced that, after all, making an accurate brain atlas model is something worthwhile doing. My thought of making such a mesh was further amplified by my continuous improvement of the iso2mesh toolbox, which is targeted at solving the exact problem: creating high-quality tetrahedral mesh from volumetric images. With a number of new meshing pipelines added in iso2mesh, the goal of making a better brain atlas mesh was getting more and more tangible. Apparently, the MNI segmented brain volume is no longer sufficient to enhance the resolution and accuracy of the brain anatomy. This is particularly true for the gray matter (GM) and white matter (WM) surfaces. Additional inputs must be sought such as those from FreeSurfer. the surfaces only cover the cortex domain, they do not include cerebellum, brain stem and ventricles. The MNI segmented brain atlas do contain cerebellum, brain stem and ventricles, however, they are labeled with the same numbers as GM/WM. They must be separated and merged with FreeSurfer meshes to build a full-head mesh. The FreeSurfer surfaces are defined in the RAS coordinate system, but the MNI image is in the MRI coordinate system. These two must be registered before use simultaneously. We want to keep the total node number under a manageable size (preferably less than 100,000). That means the sum of all nodes on the surfaces of skin, CSF, GM and WM should be certainly below this limit. For issue 2.1, the existing function "meshresample" is able to down-sample the surfaces nicely, however, it can not fix the self-intersecting elements (i.e. issue 2.2). Fortunately, the new additions "remeshsurf" and "surf2vol" in iso2mesh can be used to achieve both. For issue 2.3, we can exploit the gray-scale-image surface extraction feature in iso2mesh to produce a more accurate CSF and head surfaces. The more difficult part is related to issues 2.4/3. To "patch" the missing brain anatomies, one has to run multiple trips back and forth between the FreeSurfer surfaces and the MRI image space. To best preserve the features from the high-density GM/WM surfaces from FreeSurfer, we also need to use sub-millimeter resolution in the voxelation process. At the same time, we can not ignore issue 5, which requires us to keep the node number small. This is where the "radbound" option in iso2mesh comes in to play: one can use the radbound parameter to define the maximum element size for each given surface. Moreover, another parameter, "distbound", can be even more helpful here: it can enable iso2mesh (more precisely, CGAL) to produce fine mesh near sharp edges, and coarse mesh in smooth regions. A combination of the two should allow us to get close to the desired mesh size. Assumption 1: we assume that the 4 surfaces we are about to create - skin, CSF, pial and white-matter - are enclosing each other in the mentioned order. There is no intersection between the surfaces. At last, we merge all 5 surfaces - skin, CSF, GM, WM, ventricles - into one surface, and call the mesh generator to populate tetrahedra inside each layer. The script, listed below, takes about half a hour on a relatively new machine, among which the first two "surf2vol" calls alone take about 15 min). This script also requires your system to have >6 GB memory. If you are interested in reproducing the results, please let me know and I can share you with the raw data files. Some of you may get scared when reading the complex diagram and script in the preceding sections. I am sure you are not alone. After all, it is not a simple problem we are dealing with. We are trying to build something quite complex, not complex per se, but depending on imperfect and non-coordinating results from several other components, not mention we have a list of constraints to satisfy. On a second though, I feel quite excited. In the end, the script "magically" did the work, automatically! The magic rather comes from the ability to access each incremental step over a complex meshing pipeline, facilitated by the modular design of the iso2mesh toolbox. This is exactly what this toolbox is meant to be: it is not only a one-liner mesh generator, but also it exposes you all the internal modules so you can combine them and use them intelligently to solve much more complex problems.